The Oompah Band is one of the country’s most successful Bavarian bands and has been an established German Um Pah band since 1978. 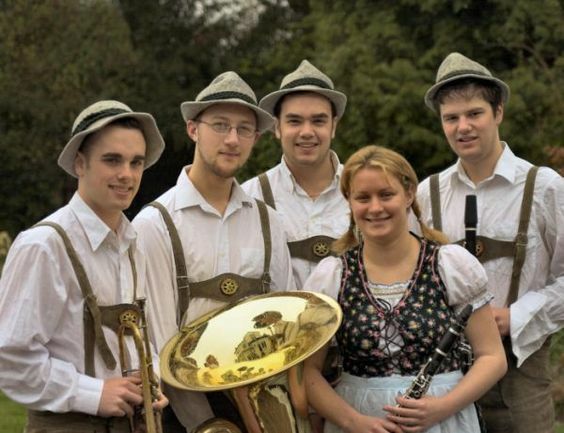 The band uses first class professional musicians and is based on a traditional Bavarian band consisting of 2 clarinets, trumpet, trombone and tuba although the band can also perform as a 4, 6 or 7 piece line up adding accordion and drums. 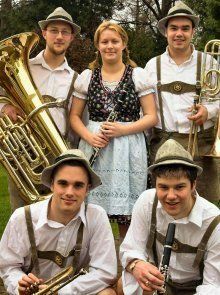 The band can add a touch of class and a bit of something different to any event and can perform anything from traditional Bavarian music in the background to a full Bier fest for your clients! 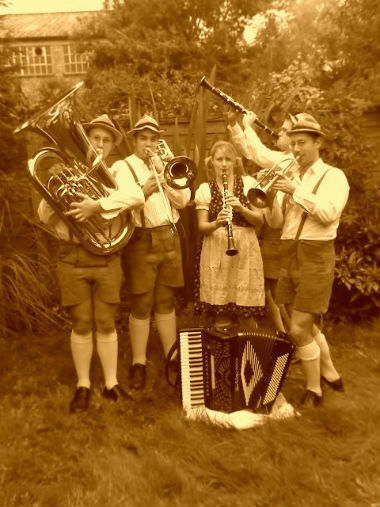 The Oompah Bands main strength is German Bier Keller or beer cellar nights and they have a vast repertoire of both traditional and popular German music and English sing-along tunes. There are vocals in both English and German and they play in traditional German Lederhosen costume. 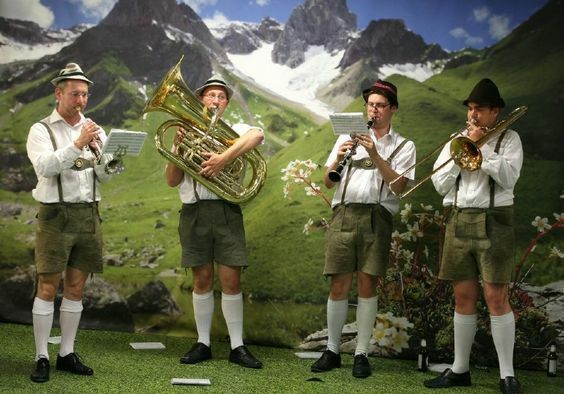 The oompah band can perform both indoors and outside and can stand, sit or stroll around a venue. They also provide a free German 1 litre stein hire service upon request. A typical Bier Keller night would consist of a performance of either two or three sets, the first usually being mainly traditional music to set the atmosphere with plenty of Bavarian toasts to get the beer flowing. The second set usually contains more audience participation and games with Um Pah music to accompany and a few old favourite English songs. The third set or ‘party’ set is packed with rousing German and English songs from ‘Val der Ree, Val der Raa’ to ‘Daisy Daisy’ and ‘The Dambusters’ to ‘Que Sera’ and involves lots of drinking, dancing, singing and thigh slapping! The Oompah Band have played at venues around the world including performances in Germany, Italy, the Channel Islands, and Ireland. The standard length of performance is 2 x 45 minutes or 3 x 30 minutes. The Oompah Band run workshops in primary schools. These include introducing brass instruments, singing, dancing and would involve teaching groups of up to 30 from 15 minutess to an hour, often followed by a full school assembly and finishing with a concert. For a German style workshop, we would keep it more music based but with reference to the oompah element of German music. The workshop includes singing and if requested a bit of gentle dancing. The workshops are more beneficial when the groups are split into smaller groups. For instance, teaching for 25 minutes with 4 different groups would be more constructive. The band are equally happy to teach the whole school for 45 minutes which would include playing a tune, an introduction to the instruments, followed by some more German music with some participation from the students.